ALA > News > Rethinking Digital Literacy to Serve Library Staff and Users, new eCourse! Rethinking Digital Literacy to Serve Library Staff and Users, new eCourse! 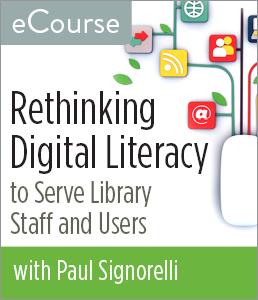 CHICAGO — ALA Editions announces a new eCourse, Rethinking Digital Literacy to Serve Library Staff and Users, facilitated by Paul Signorelli. This four-week asynchronous eCourse starts Monday, July 13, 2015. Supporting digital literacy still remains an important part of library staff members’ work, but sometimes we struggle to agree on a simple, meaningful definition of the term. In this four-week eCourse training/learning specialist Paul Signorelli will begin by exploring a variety of definitions, focusing on work by a few leading proponents of the need to foster digital literacy among people of all ages and backgrounds. He will explore a variety of digital-literacy resources – including case studies of how we creatively approach digital-literacy learning opportunities for library staff and users, and will explore a variety of digital tools that will help to encourage further understanding of this topic. Now, who is ready to build their digital-literacy skills and help their users become digital literate as well? Paul Signorelli, co-author of "Workplace Learning & Leadership" with Lori Reed, is a San Francisco-based writer, trainer, instructional designer, and consultant explores who fosters and documents innovations in learning. Having earned an MLIS through the University of North Texas (with an emphasis on online learning), he remains active in the American Library Association, the New Media Consortium (educational technology), and the Association for Talent Development (formerly the American Society for Training & Development). Registration for this ALA Editions eCourse, which begins on July 13, 2015, can be purchased at the ALA Store. Participants in this course will need regular access to a computer with an Internet connection for online message board participation, viewing online video, listening to streaming audio (MP3 files), and downloading and viewing PDF and PowerPoint files. ALA Editions publishes resources used worldwide by tens of thousands of library and information professionals to improve programs, build on best practices, develop leadership, and for personal professional development. ALA authors and developers are leaders in their fields, and their content is published in a growing range of print and electronic formats. Contact ALA Editions at (800) 545-2433 ext. 3244 or editionscoursehelp@ala.org.